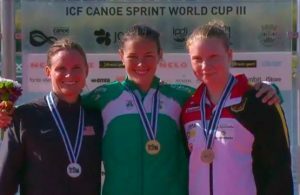 Canoeist Jenny Egan of the Salmon Leap club in Leixlip won a gold medal at third sprint canoe World Cup in Montemor-o-Velho in Portugal. Three women battled it out in in strong winds at the finish with Egan making it to the line first in 23 mins 31.480 secs with .99 of a second to spare over Margaret Hogan of the USA who was timed at 23:32.470. Germany’s Melanie Gebhardt of Germany took third in 23:33.450. gan had finished second a week earlier at the second World Cup in Radice, Czech Republic and third at last year’s European Championships over a distance that clearly suits her. She also reached the A final of the K1 500m, where she clocked a time of 1:55.180 and was second in a closely-fought 200m B final. Both Barry Watkins and Michael Fitzsimon won B finals – Watkins in the K1 500m, where he clocked a time of 1:41.292 and Fitzsimon in the K1 1000m. Not only did the sun shine for the inaugural European Small Nations Beach Volleyball tournament in Perth, but the Scottish host won both men and women’s titles. Taking part were the 48 players from Scotland, Wales, Luxembourg, San Marino, Northern Ireland and Ireland. Ireland may not have finished in the medals, but Miriam Gormally and Marie-Claire Sabogal made the quarter-finals of the women’s competition losing to a Scottish pair. Benny O’Regan and Oisín L Mac McArdle lost to Luxembourg pair and Northern Ireland in the men’s draw, but ended their tournament with a 2-0 victory over Wales. O’Doherty Digs Deep for Mini Marathon Victory. Harty wins Cork Marathon. Plus results.